YourCADservice specialist Building Survey Department is ready to help you meet the stringent demands of the Land Registration Act 2002. 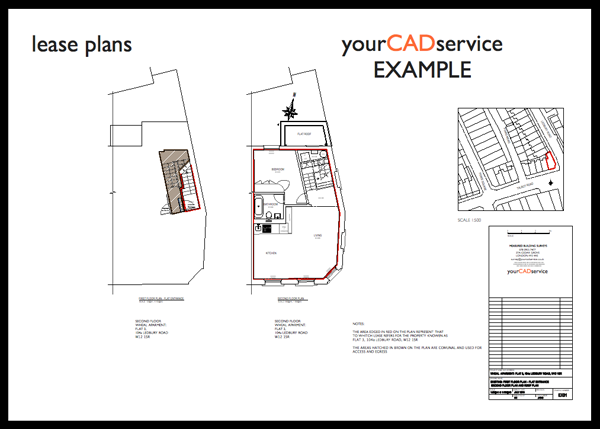 Set out below are the requirements, and we would be pleased to provide you with a fixed price quotation for providing the necessary plans for your properties anywhere in the UK. The Land Registry's requirements for plans will be more important to commercial landlords because the obligation to register leases will be extended to include all those granted after 13 October 2003 for a term of more than 7 years and those previously unregistered leases assigned after 13 October 2003 which have more than 7 years to run at the date of the assignment. Note that the Land Registry intend eventually to reduce this period to 3 years. The scale and orientation must be clearly shown. The preferred scale is 1/500, but the registry will accept 1/1250, if the detail is clear. Anything in between will do. Plans which have disclaimers such as "for identification only" of "do not scale from this drawing" are unacceptable. The plan must be based on an accurate survey, plotted to the chosen scale. The accuracy should be within the plottable limits of the scale i.e. distances scaled from the plan between well defined points of detail should be accurate to within 0.3mm at map scale plus one part in one thousand of the distance measured (+/-150mm). Any measurement shown must be in metric form. The plan must show sufficient detail to reveal the position of the demised premises in relation to the boundaries of the land in the registered title or to other details shown on the Land Registry plan. If you require a copy of the Land Registry plan for a particular property please let us know. The plan should show the extent of the demised premises and the number or other reference identifying it. The external boundaries of the unit should be edged in colour to avoid any other misinterpretation. If the unit is in different parts, for example on several levels, each seperate parcel must be identified, using a different number or reference, if possible, to avoid confusion. You may use the same number with a different prefix - for example LG3 and UG3.